Dr. Detering was arguably the world’s foremost ‘Jesus mythicist,’ one who holds that Jesus of Nazareth is pure fiction, a figure created by the early Church—a ‘myth.’ Detering came to this view through his work on Paul. Paul was, in fact, Detering’s initial focus as well as his enduring specialty. His career began with a careful study of the epistles—but not from any traditional vantage point. Already as a student Detering looked on the epistles from the viewpoint of the Dutch Radical School (DRS), which maintained that all the Pauline epistles are ‘inauthentic.’ Detering’s dissertation was on the DRS, later edited for publication (Paulusbriefe ohne Paulus: Die Paulusbriefe in der holländischen Radikalkritik). The inauthenticity of the Pauline epistles eventually led Detering to the inauthenticity of Paul himself. Study of non-canonical texts (particularly of the Pseudo-Clementine literature) convinced Detering that ‘Paul’ was a cipher, a domesticated version of the first Christian Gnostic and father of all heresy, Simon Magus. One clue that led to this remarkable conclusion is the equivocal role of Peter both in the New Testament and in non-canonical literature. In the Pseudo-Clementines Peter opposes Simon Magus, while in the New Testament Peter opposes Paul (Gal 2:11 etc. Cf. Goulder, St. Paul vs. St. Peter). In his last years Detering made a particular study of the Odes of Solomon and came to strongly suspect that the Odes were penned by Basilides, an early second-century Gnostic of Alexandria. It was about this time that I befriended Dr. Detering—he penned an endorsement for my second book, NazarethGate (Dec. 2015)—and I was able to introduce him to my views of Buddhism as a gnostic religion and also to Yeshu ha Notsri, whom I consider a first century BCE ‘Jewish-Buddhist,’ exiled for many years in Alexandria (see NazarethGate, chp. 14). Detering and I then cooperated on several scholarly ventures, translations, and the like, culminating in his book-length article, “Buddha, Joshua, Jesus and the Way to the Other Side: The Gnostic Interpretation of the Exodus and the Beginnings of the Joshua-Jesus Cult”. On this website is my extensive series of posts commenting on this article. Dr. Detering encouraged me to translate his article and combine it with my commentary in a book. While that English monograph has not eventuated, Detering did publish his German article in book form. It was his last publication. I hope to publish (as time permits) about one post a week dedicated to the Hermann Detering legacy. The project will probably take several months. My plan is to proceed in general chronological order, thus providing a glimpse into the development of Detering’s thought over the years, as well as the detailed content of that thought in Dr. Detering’s own words. I encourage those of you who have the time to read these posts in order as they appear. 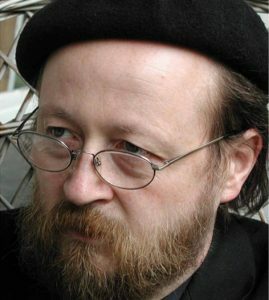 Given that Detering was unquestionably the foremost European Jesus mythicist of his generation, reading these posts will provide an unparalleled education in Jesus mythicism and, in fact, will provide a corrective to the overwhelming amount of pseudohistory found in academe, church, and traditional channels. For those of us who seek to ‘set the record straight,’ Dr. Detering’s work can provide an up-to-date, marvelous, and unprecedented path forward. “Die Scheune” (The Loft), Dr. Detering’s comfortable study in Neukirchen (province of Altmark), Germany, located in the attic of his house. In the coldest winter months the study was unavailable due to inadequate heating. It is so large that the books seem modest accessories, yet note the four metal bookcases in the middle of the room with more probably behind the camera. In fact, Dr. Detering had an impressive library comprising several thousand volumes. Fluent in German, Dutch, Greek, and Latin, he also possessed excellent reading/working knowledge of English, Italian, Spanish, Hebrew, and Aramaic.